Größe der PNG-Vorschau dieser SVG-Datei: 512 × 416 Pixel. Weitere Auflösungen: 295 × 240 Pixel | 591 × 480 Pixel | 739 × 600 Pixel | 945 × 768 Pixel | 1.260 × 1.024 Pixel. This diagram was developed by consensus. Before modifying it, please read the full discussion archive. If you still want to change it, please first discuss your proposed changes at the talk page on Wikipedia. Die vorliegende Datei löst die Datei British Isles Euler diagram.svg ab. Es wird empfohlen, die vorliegende Datei statt der verlinkten Datei zu verwenden. Why is "Ireland (state)" used instead of "Republic of Ireland"? Ireland is the legal name, while Republic of Ireland is the legal description. Also, "Ireland (state)" is more parallel with "Ireland (island)", so it shows the difference clearly. Why is Northern Ireland included under British Islands when it is not an island? British Islands, confusingly, is a legal term that includes the entire U.K. as well as Isle of Man and the Channel Islands. See en:British Islands. British Isles is offensive and biased toward the United Kingdom. It should say "Great Britain and Ireland" or "These Islands". There is controversy surrounding the use of this term, and its use is being discussed at en:WP:BITASK. If something new comes out of that conversation, this diagram would certainly be subject to the new terminology. Why does the legend use "legal" instead of "political"? This is to cover terms like "England" and "British Islands", which were felt to be better described by the word "legal", because they don't have political or governing bodies. 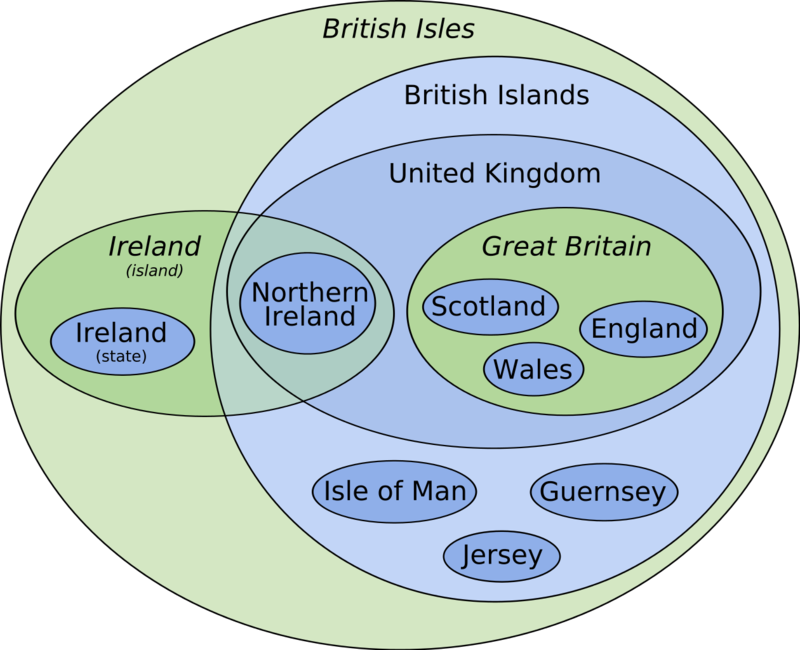 England has no independent jurisdiction, but is just the part of the U.K. that is not Scotland, Wales, or Northern Ireland; why is it on the diagram? It is one of the four Constituent Countries. It may not be an entity, but it certainly has some sort of definition within the context of these constituent country divisions. That's why the legend says "legal distinction" instead of "legal entity". The Crown Dependencies should be circled and labeled as such. It was determined that this added clutter to an overview, and also might imply that they are some kind of entity together, when really they are three separate entities. The Channel Islands are geographically a part of France, not the British Isles. This is an area where the difference between "geographical" and "physical" becomes apparent. They are included by their historical and cultural links, and because they are in proximity of Great Britain and Ireland (even if they are physically closer to France). Regardless, all sources point to British Isles being a geographical term that includes the Channel Islands, and it would be original research for the diagram to show something different. See this other discussion for more detail. Some parts of Scotland, England, and Wales are outside of Great Britain (i.e. separate islands). This is another instance of the blurry line between geographical and physical features. The term Great Britain can refer to just the main island, or it can refer to the combined territories of England, Scotland and Wales, including their smaller islands (such as the Isle of Wight, Anglesey, Shetland, and others). It is in the latter sense that it is used here. "England and Wales" should be shown as a legal distinction. Technically, yes, but it was left out because this is an overview diagram. Once terms like that were included, there was much disagreement over what other legal or political relationships should also be included, and it became too complex. A political-only diagram was proposed for these kinds of details.